Today, our youth harness the power of technology to bring about change. It has been 40 years since students in Soweto rose up and protested against Afrikaans as a medium of instruction in schools. Looking back at some defining contributions of youth in each decade since, it appears that the youth of today are re-surfacing as active citizens by harnessing technology to create change. The youth of the 2000s lived the tech boom – moving from raves and pride rallies to screens and keyboards. They connected with the world in an entirely new way – through chat rooms, forums and html code. Switching from encyclopaedias to Google, MXIt to Whatsapp, MySpace to Facebook and the 140-character world of Twitter, they indulged on information. A generation on, those online platforms are being used to stir campaigns and organise drives – including the mobilisation that provided #FeesMustFall protesters with water, food and data bundles in October last year. Young people are also using the web to find and interact with good causes, brands and businesses. Surveys, such as one conducted by Deloitte earlier this year, reveal that Millennials (those born after 1980) are not solely interested in snapping selfies. 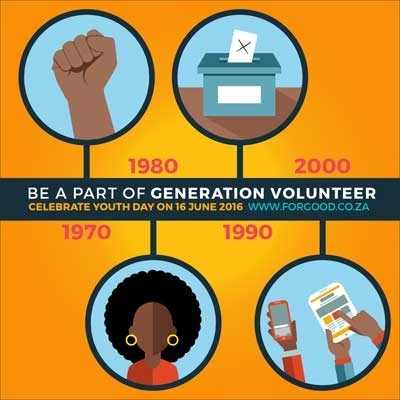 "Every generation has played a part in pushing South African society forward. Young people today are emerging from behind their screens as active, engaged citizens; this could be the most powerful movement of our time," says Andy Hadfield, CEO of online volunteering platform www.ForGood.co.za. Millennials report greater interest in supporting brands with a conscience and a desire to work for businesses with sustainable development agendas. "We need to capitalise on this engagement by creating spaces and for young people to become and stay vocal and socially active," says Hadfield. Forgood logs real-time needs from registered nonprofits across South Africa. In addition to connecting people with these existing needs, it allows users to make unique offers. Since re-launching in early 2015, forgood has facilitated over 3 000 actions for nonprofit organisations in the country. "Many young people are required to do community service as a part of their school curriculum. Finding a place to log these hours can turn an amazing opportunity into a time-consuming task. "On this platform, learners can browse real-time needs according to their location, interests or skills," says Hadfield. During the winter months, there is always a surge in requests for cooked food and warm clothes – knitted or collected. Active citizens can also get involved in youth-related activities, such as tutoring, mentoring or helping causes manage their social media accounts. "In recognition of Youth Month and the contribution of generations past, clear out some clutter, give up an afternoon or share your skills online – it has never been easier," says Hadfield. For more information, visit Winter Warm Up Campaign, Youth Month Campaign or the For Good website. Press release supplied by the ForGood organisation. Do you encourage your children to become active citizens and help in their community? Send your comments to chatback@parent24.com.